1. How do you describe a gamma, alpha and beta diversity? 2. Why at there more species near the equator? -tropics tend to be more productive (due to increases in light, H20 & nutrients) and can support more life. This increase in life increases species interaction and drives more specialization/niches. 3. Why are some species more abundant than others? ⁃ Most abundant species are also relatively more abundant. 4. What is a terrestrial biodiversity hotspot? 5. What is an endemic species and what is unique about it? An endemic species is a species that occurs only in one unique locale. Therefore, a local extinction for an endemic species is a global extinction by default. 6. Describe the biological diversity patterns. Species richness shows pronounced latitudinal gradients. Species richness can vary widely among locations and regions. Rank abundance plots display from most common to rarest, usually on a semi-log scale, which reveals that a few species are common and many are rare. 7. How many known species are there and how many are unknown on earth? Approximately 2 million known species and estimates of (10-30) million unknown species. 8. What are some of the hidden costs of not protecting biodiversity? 9. About how many new species of fish are discovered each year? 10) Discuss how island size and distance from mainland effect species colonization and extinction. 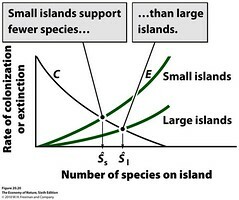 Where colonization and extinction meet you have an equilibrium, which determines the number of species on the island (x axis). On the small island, the rate of extinction is higher than on the large island because there isn't enough space for everyone! So you end up with less number of species. On the far island, the rate of colonization is lower than on the near island, so you end up with less species here as well. 11) Name two regulating services and two provisioning services the ecosystem provides. For each service you list, provide an example of how that service is/will be impacted given human behavior. • Provisioning: Fresh Water – In the US, human consumption of the Ogallala aquifer outpaces the natural replenishment, meaning that the aquifer will eventually dry up, impacting fresh water availability in the US Planes, particularly for agriculture and mining. • Provisioning: Fisheries – overfishing has resulted in most of the world’s commercial fisheries to be fully exploited or overexploited threatening the fish species, fish biodiversity and a significant food and employment source for communities around the globe. • Regulating Service: Erosion Regulation – the conversion of land to human use (e.g. agriculture) has increased erosion. 12. Explain the difference between conserving species diversity vs. phyla diversity? Of the 35 phyla, 96% of all animal species are represented in only 9 of them. This means that you can preserve phyletic diversity while allowing the numbers of species in an ecosystem to fluctuate up or down. Phyletic diversity is more concerned with the functionality of an ecosystem. If multiple species perform similar functions in an ecosystem, as one species declines the other increases and fills the niche. A situation like this may not be detrimental if there is a general preservation of higher order diversity and the ecosystem remains functionally intact. However, because our ecological understanding of the environment is limited it may be presumptuous to assume that species can replace the function of other species in an ecosystem. If every species has an intrinsic worth to an ecosystem then the species biodiversity becomes significant. 13. What affects Colonization and Extinction Rates? Island or fragment area and distance are the two primary factors in the creation of biodiversity on an island or fragmented area. The more isolated a fragment is, fewer species are actually able to colonize it. Therefore it's biodiversity will be lower. The size of the fragment determines the total number of species that can inhabit the land, as well as the population size of each of those species. Larger populations have a greater chance of surviving and so the larger the island, the larger population, and a lower extinction rate. This results in large islands that are not separated by large distances having the greatest biodiversity. 14. What are the general patterns of species abundance and richness both globally and in an ecosystem? Globally species diversity is greatest at the lower latitudes. One theory for this is that there has been no glacial disruptions and so species have had more time to develop and diversify. There are also hotspot areas with high diversity, these areas may just have favorable conditions for speciation. Lastly endemic species are found locally and can be unique to specific parts of the world. When these species go extinct in their range, it is actually a global extinction because they are not found anywhere else. Generally in an ecosystem diversity is dominated by a few commons species, and then peppered with multiple rare species. The dominance by the few species form a core community that sustains the ecosystem. This community may provide the main functions of the ecosystem or may still depend on rarer species for important services. As environments become disturbed the dominance of the core community usually becomes more pronounced, as rarer species are no longer able to survive. 16. Demonstrate you understand one variation of the “species-area” equations and its implications for biodiversity. As we look at larger areas (starting from small local patches and going all the way up to continents), we have greater chances of finding a larger variety of species.